Knowing what we discovered in Part One of the power of the arts, the Nazi fear of music was not as inconsequential to the super-power as we might think, nor was it wholly a matter of wounded pride. Music, was, in its own small way, a real threat, because, like art and books, it could shape the way people thought, the way they acted, and what they believed. Worse still, it could bring hope to those who opposed them and potentially convince others to fight against them. The Nazis and Goebbels, despite the lack of scientific studies we enjoy today, realized that if they controlled music as they controlled media and the other arts, they could manipulate nearly everyone within their sphere into a belief chosen for them. They could regulate what sound was released to the people—in addition to visuals from art, books, movies, etc. Through music the Nazis might find the ability to bring about a national pride and slowly kill anti-Nazi movements and people… taking away anti-Nazi hope and pride. A song can be used as a release of joy, sadness, love, or even used as a covert weapon. A weapon of hate, pride, hope, or courage. As the Nazi party had begun controlling media and the arts as early as 1933, by the start of the Holocaust in 1939 the German people and all those under Nazi control had already undergone many changes in their views. With this a simple war was all that was needed to bring about the fear required to push the masses into true pro-Nazi standing. Israel Cendorf’s legacy was neither as a singer nor a musician, yet he managed to bring forth music from his words… causing his art to sing. 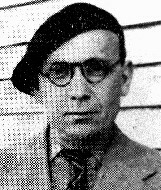 Born May 19, 1902 in Lodz, Poland, Israel Cendorf was expected by his family to become a Rabbi—an admired leader within their community. Yet, Israel had other ideas. At 16 he apprenticed himself to a printer, removing any lingering hopes that he might pursue rabbinical training. Israel would soon find that, despite his apprenticeship as a printer, he had developed a love for the written word that would drive him forward. He began writing poetry, even songs, and soon had a book of his poetry published. But when Hitler rose to power in 1933, Israel chose to move to Paris where his work would not face stringent Nazi censorship. Paris, however, was not easy. Unemployment was common due to lingering European recessions. Scarcity of employment meant that immigrants, particularly Jews, were in constant danger of being deported to give the country’s native-born population greater access to scarce jobs and resources. Indeed, times were so trying that, despite his writing skill—as a member of the Writers’ Union and working for News Press—Israel was still found peddling wood door-to-door to sustain his family. His life in Paris, while hard, was manageable until Germany occupied the city in June of 1940. After nearly seven years of German occupation his life began to change, as he decided to go to work for an underground movement. Lasting only eleven months, he was captured and deported to Pithiviers, a transit camp. “Our courage is not broken, life is marvelously beautiful. Victory will soon be spoken, we will triumph over all. See the world once more in flowers, just like the month of May. Even in 1942, as Israel and many others were transported to Auschwitz, knowing full well they were being led to die, they sang it… showing their courage one last time, letting their oppressors know that mere death was not enough to take away hope. Israel, a victim of Auschwitz, remembered through his writing, but perhaps even more so, for bringing faith to thousands; for fighting Nazi suppression in the darkest of places… for writing words of hope that became a banner of courage—where he found the power of a song. David Wisnia, known today as a singer, speaker about the Holocaust, and for his book, One Voice, Two Lives, grew up in Warsaw, Poland. In Poland as a young boy, David was trained by famous director/composer, Maestro A.Z. Davidovich, as well as by several well-known cantors of the day. With this training and God’s gifts he worked in choirs, sang on-stage and even on a Polish radio station! Yet, the German invasion and Nazi rule quickly took away many freedoms, such as performing outside of the Warsaw Ghetto… but that was only the beginning. Returning home one day after his father had asked him to take his place at work—possibly a ploy to keep his son David safe—he found that not only could he not return home because that section of the ghetto had been closed off, but his father, mother, and brother had all been massacred after David’s father resisted their being sent to Treblinka. Soon, David, a 16-year-old Jewish boy made man by circumstance, who had once merely faced persecution and not been allowed to share his talents, found himself alone in the most horrific place of all… Auschwitz. There, out of 1,500 arrivals on his transport, David was one of six not to have immediately been sent to the gas chambers. David struggled to survive as he was forced to carry bodies to the crematorium, but only a few weeks after his arrival he was given an in-camp occupation far less demanding, all because his captors learned that he could entertain them by singing and playing the piano. Through his God-given talent of singing David became a privileged prisoner and even managed to help boost the morale of his inmates through songs—songs only allowed because of his privileged status. For nearly three years David lived in Auschwitz, his privileged position giving him comfort but not guaranteed immunity against death. Still, through it all he managed to survive and bring a ray of hope to those around him. 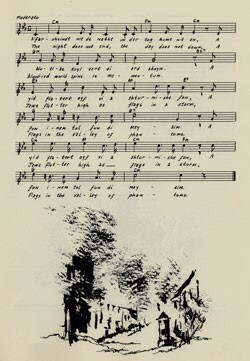 While interned in Auschwitz, David wrote two songs, ‘Oswiecim’ or ‘Auschwitz’ and ‘Dos Vaise Haizele’ or ‘The Little White House in the Woods,’ both of which had to do with the horrible nature of Auschwitz. 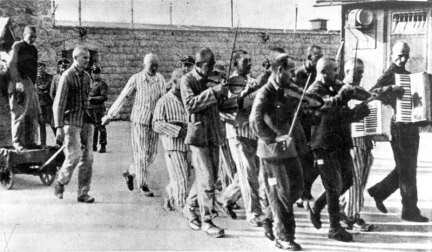 These songs, while dealing with darkness, held for the prisoners of Auschwitz a sense of hope. In late 1944 as the Allies were closing in, prisoners of Auschwitz were marched, or transported to, other camps such as Dachau—journeys which caused many to die in the cold December snow. David quickly realized that he needed to escape if he was going to survive. He knew that while Auschwitz had been horrible for him, he might not survive when he was no longer a privileged prisoner. One day, while being transported, David bravely escaped. Yet, David did not stray from danger as he fearlessly joined the 506th Parachute Infantry where he helped the Allies win the war in 1945. After the war ended David immigrated to the United States in an attempt to find his last surviving relatives. There, David continued not only his singing career, but worked to bring awareness to the Holocaust through his songs of Auschwitz, such as ‘Oswiecim’—only recently translated—through talks, and writings. His arts. To never forget that wherever our gifting is, be it in the arts, business, media, or elsewhere… it has power! Power to change lives, fight suppression, and bring hope! In this hour it is important for us to leave a legacy of hope! With My Olive Tree’s Holocaust Victim Legacy Package YOU can sponsor an olive tree in Israel in memory of a Holocaust victim while also giving a warm blanket to a Holocaust survivor, showing them that they are not forgotten. Bringing hope once more! Additionally, with your sponsorship you are giving to the people and land of Israel jobs and beauty for generations to come. YOU can leave a legacy of life and remembrance! YOU can bring hope!